Fleming's latest historical, set in Indiana and Kentucky during the final months of the Civil War, is jagged around the edges yet moving and memorable. Based on the true story of a partisan militia intent on uniting Kentucky, Indiana and other Midwestern states against the Union, the novel begins when Union officer Maj. Paul Stapleton falls in love with Southern belle Janet Todd. She and her father, Gabriel Todd, are involved in a clandestine organization called the Sons of Liberty, whose disillusionment with the war has led them to armed resistance and traitorous acts against the Union. Stapleton, himself disenchanted with the killing, is torn between his love for Janet and his patriotism. Col. Henry Gentry, a Union veteran who lost an arm at Shiloh, recruits Stapleton to spy on the Sons of Liberty, but as Stapleton gets more involved with the association, his loyalties become unclear. After a slow start as the large cast is introduced, and some awkward transitions to melodramatic flashbacks, the characters and their dilemmas come to life. Appearances by such historical figures as John Wilkes Booth and Mary Surratt and reprints of actual letters between President Lincoln and Colonel Gentry foster suspense. The stories of the real people the characters are based on were collected in the 19th century and protected from publication until after their subjects' deaths. 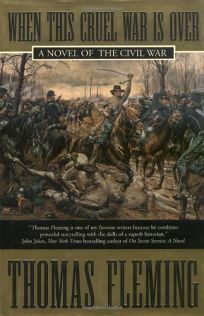 Their history has been carefully reconstructed by Fleming (The Duel; Remember the Morning), whose tendency toward sensationalistic prose can be forgiven in the moving evocation of the Civil War's emotional tragedy. (Mar.) Forecast: Targeted marketing by Forge, including ads in Civil War Book Review, author appearances at SEBA and GLBA, and an excerpt in the mass market edition of Fleming's Hours of Gladness, should only enhance sales of this new title by an ever-popular author.